Italy, 2002, 100 minutes, Colour. Richard Harris, Vittoria Belvedere, Benjamin Sadler, Ian Duncan, Bruce Payne. 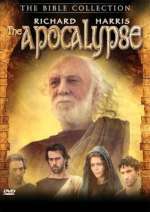 The Apocalypse (L'Apocalisse) is part of the series of principally Old Testament stories filmed in Italy from the later 1990s (including Abraham, Joseph, Moses, Jeremiah, David). Richard Harris, in one of his final roles, plays the aged John the Apostle on Patmos. The emperor Domitian has proclaimed himself a god and Christians are being persecuted. They want John to come to the community in Ephesus to strengthen their resolve. The screenplay creates a fictional story (along the lines of Quo Vadis) about the son of a general who is a Christian, a young woman he is in love with. This sub-plot provides scenes of prisoners in the quarries of Patmos, Roman oppression, an escape attempt and for John to do Jesus-like things in caring for the prisoners. This is the context for some mystical visions which form the core of the book of the Apocalypse. In them, there are brief flashbacks to the crucifixion and, when John sees a man flogged, a flashback to Jesus' scourging. Within the visionary sequences, a glorified Jesus is seen with the 144,000 saved in their white robes. He is pictured reading the names of those written on the scroll. There are many lamb images, especially of the lamb that is slain. The Apocalypse provides an opportunity for Richard Harris to give moving renditions of passages from John on love and to voice key apocalyptic sequences like those of the Four Horsement, the breaking of the seals and the coming down of the new Jerusalem. 1.The success of a film of a difficult book to film? Visualise? The idea of the film? The scriptural book, its symbols, the images of the first century Christians? The visual style? Creating a narrative? 2.The production values, the biblical series? Interpreting the book of the Apocalypse for a contemporary audience? Imagining it? Audience knowledge of the book and its imagery? 3.The international production, the cast, Italian background? Language, accents? 4.Audience knowledge about John the Evangelist, the Gospel, his letters? His life, old age? The first century and the times? The church, persecution? The Roman empire? The visions of John? Encouraging the Christian communities of Asia Minor? 5.Richard Harris as John, an old man, his memories, experience, the place of veneration in the communities, living in seclusion? The communities seeking him out? For encouragement during persecution? His presence in the prison, his kindness to the prisoners, like Jesus offering a cup of cold water? His own suffering? His personality? Venerable? Richard Harris and his style of quoting the Scriptures? 6.The background of Rome, the Emperor Domitian, the court, declaring himself a god, his madness, his advisers, the military, the massacre of Laodicaea? His assassination? 7.The Roman generals, in Rome, their ruling of the provinces? The general and his son? Taking over from the previous administrator, humiliating him? The quarries, the severity of the prison guards? The death of Domitian? The former governor and his rule of the prison? His being dismissed? Peace? 8.The Christian communities and their fears, the couriers bringing the letters of John, the manuscripts and the scrolls? The people wanting to see John? 9.The fictional story for the film, the life of the early Christians and their reactions, the persecution and their leaving Ephesus, life on the island of Patmos? The prison quarry? 10.The personal fiction, Valerius, his relationship with his father? His stances, Christian, in prison, working in the quarry, in isolation, torture, the plan for the escape, the group being trapped by the rock fall? Irene and his love for her, her seeing him in the quarry? His seeing John in action, seeing Irene? The escape, the reconciliation with her? 11.Demetrios, his working for John, assistant, the letters? 12.The escape, the pursuit, Demetrios being wounded, saving the others? 13.The aftermath of the persecution, peace, the growth of the communities? Valerius and Irene together? John and his continued old age? 14.The importance of creating the Apocalypse in images: the visions of John, his memories of the crucifixion and of Jesus, the vision of the Horsemen of the Apocalypse, the breaking of the seals, death and plague, silence? The Heavenly court, the hundred and forty-four thousand in their white robes, the lamb that was slain? The new Jerusalem coming down from Heaven? The film as a way of responding to the imagery and message of the Apocalypse?